We are Bob and Kathy Eggett and we are based in beautiful Southwestern Washington, USA. These are pages of our adventures riding GoldWing motorcycles in North America, Europe and a small piece of Africa and 5 months by campervan in Australia. They are intended to keep our relatives and friends updated with the progress of our travels and will be updated at irregular intervals with our adventures. New pages will be announced on this page as well as being in the menu system. 2006/7/8 - 45,000 miles through Europe - Direct links to each of the 100 European travel pages are here. 2018 - Big Changes and The Alps Again. Many people have asked us about our tent trailer. So I have built a Trailer information page. We started with a 1980 GoldWing GL1100 (never named). After 95,000 miles we sold it and bought the 1995 GL1500 (The White Dragon, 147,000 miles) and a TimeOut tent trailer. In 1999 we bought a CycleMate cargo trailer for our trip to Mexico. In 2006 we shipped The White Dragon to Europe for three years. In 2007 we purchased a matching 1995 GL1500 (The White Bear, 25,000 miles) because we had no bike to ride while we were home from Europe. In 2008 we wrecked the White Dragon on a rain slick freeway in the heel of Italy. In November of 2010 we bought a bright yellow 2003 GL1800 (Lemonade) with ABS and sold the White Bear. After we wrecked the White Dragon in Italy in October of 2008 and ended our European travels we still had the matching white GL1500 at home to ride. It is the bike we took to Alaska with Dirk and Hetty (our friends from Holland). Now we have the yellow GL1800 and Kathy decided to name it LEMONADE because of the trials we had during our European adventures. Her motto is "If life deals you lemons, go ride Lemonade". We traveled over North America west of the Great Plains and the Black Hills of South Dakota where we attended the Sturgis Rally for 35 years. 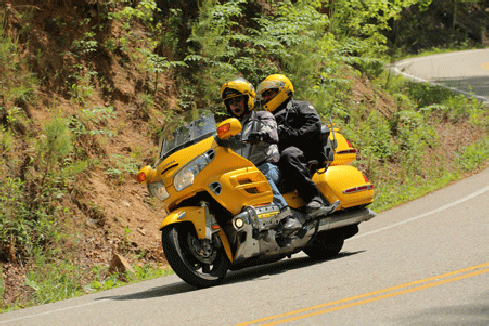 During those 35 years we have toured points from Fairbanks, Alaska, to Guadalajara, Mexico in North America; and, after retirement, in Europe, from the Ring of Kerry in Ireland to the shore of the Black Sea in Bulgaria and from the Sahara Desert in Morocco to Nordkapp, Norway; always on GoldWings. In 2014 we added an East Coast USA tour of 24,500 miles. The White Dragon was white and was normally draggin' a small trailer, hence the name "White Dragon". We still tow the CycleMate trailer but now it is yellow to match the new bike. In 2011 we traveled the length of Baja to complete our list of areas west of the Great Plains. In 2013 we bought a Lees-ure Lite tent trailer for our 2014 tour of the East Coast of the USA. Viewers interested in the European tour should probably start with the Planning page and go on to Plan B and Plan C and Plan D and Plan E, this will explain what happened to our plans. After that one can explore the Europe and N. America (including Alaska) pages. The story of our burned house is on the Fire! page in the About Us section. Under the Links, Quotes, Fun page there are some pages of interesting quotes on travel, retirement, motorcycles, beer.